The latest in GOOD's illustrated guide to The Rules are the exact details of what's generally considered to be my weekends, but they call "Flaking Out." 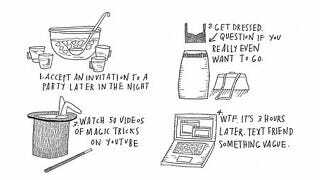 I am personally guilty of many of these glaring anti-social patterns, but none as much as getting dressed while questioning if I even want to go (rule #2) and the "eating while thinking of excuses" (#7) move. How the hell do these strangers who made this chart know me so well?